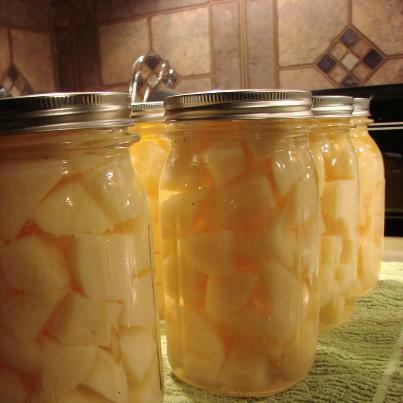 Canning Potatoes - Picture Perfect - Canning Homemade! Potatoes are one of the great veggies that we have the opportunity to put up and have at the ready for several applications. Lots of people say that I'm crazy to process potatoes since they stay good in cold storage for a long time, but having these jar in the pantry gives me another pre-cooked ingredient to make something quickly. Great for potato salad, perfect for mash potatoes, added to stews and amazing cottage fries for that special sunday breakfast with the family. I want to be clear that this recipe is for your standard potato like white, yukon gold, red potatoes, and purple. There is a different recipe for sweet potatoes. A special thanks to Sherrie for allowing me to use her "picture perfect" potatoes that she canned in her pressure canner! An average of 13 pounds is needed per canner load of 9 pints. An average of 2-1/2 to 3 pounds per quart. Choose potatoes 1 to 2 inches in diameter if they are to be packed whole. Preparation: Wash and peel potatoes. Place in ascorbic acid solution to prevent darkening. and drain again. Add 1 teaspoon of salt per quart to the jar, if desired. Fill hot jars with hot potatoes and fresh hot water, leaving 1-inch headspace. Remove air bubbles and adjust headspace if needed. Wipe rims of jars with a dampened clean paper towel. Adjust lids/rings and process in the pressure canner for 35 minutes for pints and 40 minutes for quarts at 10 lbs of pressure for weighted gauge canner and 11lbs for dial gauge. Adjust for altitude.